One of our most utilized tools here at SwellColors Glass Studio is a Dremel hand drill. These babies are small but mighty! We use our Dremel with a number of specially formatted bits for all kinds of daily tasks in our studio. The most common use is drilling glass. The most important thing to know about drilling glass is that is can be dangerous! Glass shards are very hazardous to the lungs! 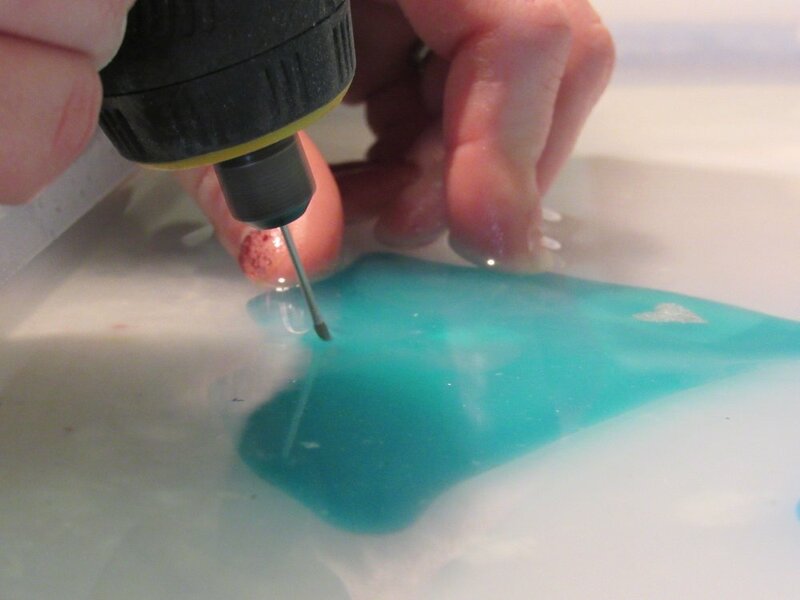 Because of that, anytime that we drill glass, the piece of glass MUST be submerged in a shallow bath of water. Otherwise, you risk both causing great damage to your only set of lungs, as well as completely damaging your expensive drill bit. But with a bit of guidance and practice, all of our artisans in the studio have become experts in drilling glass. We drill each and every glass ornament that we make by hand, as well as all of the sea glass that we use in our wire wrapped jewelry. Bring your own sea glass in today, and get some custom jewelry made out of your treasured beach finds! Order Stained Glass for Mother's Day! Original Window for April 11th: "Lookout"
Don't Forget, Mother's Day is Coming! Stained Glass for April 10th: "Fuego"